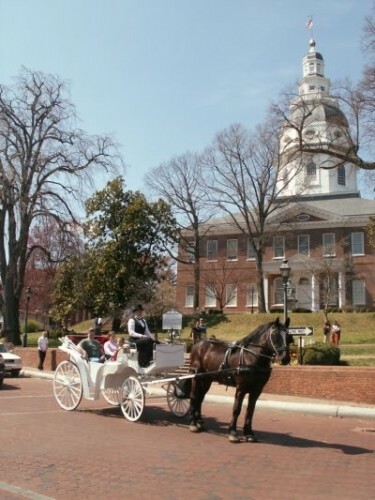 The quaint carriages that have plied the streets of Annapolis from April through November for the past seven years have likely made their last pass in the historic Capital of Maryland. Annapolis Carriage owner, Toby Rohrbach told us this morning that he will be retiring and selling the business. “We are trying to sell the business as an ongoing entity; but if we are able to find a buyer, it will be up to them to decide if the business returns to Annapolis,” said Rohrbach. Having grown up on a farm, Rohrbach is very mindful of the horses which have come to be a favorite sight for throngs of tourists who visit the town each year. He told us that the horses have a “reputation” in the industry and other carriage operators are interested in them due to their temperament and ability to work well in an urban environment. Annapolis Carriage has employed up to 11 part time guides throughout their time here in Annapolis.